It’s time again for illogiCon, our local Research Triangle, North Carolina, science fiction and fantasy convention, happening this weekend at the RDU Embassy Suites (with some events in the nearby Hampton Inn). There’s no “Baen Books Traveling Road Show” this year, because I didn’t realize until too late that I was the only Baen representative and didn’t ask for a time slot. 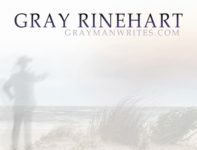 On Sunday, I’ll be skating out after lunch to head to north Raleigh to host the monthly Writers Coffeehouse at Quail Ridge Books from 2-4 p.m. All writers are welcome! With the ongoing governmental brouhaha over whether a fence or a wall is better for securing a border, it occurred to me that immigrants are like salt. A little bit of salt enhances a dish. 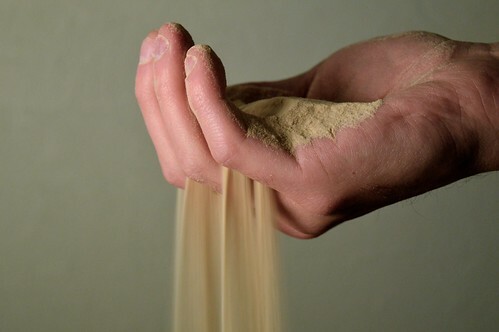 Too much salt ruins a dish: It no longer tastes like the dish it was meant to be; it only tastes like salt. 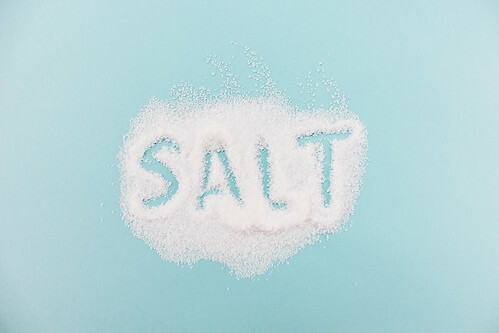 When it comes to salt, moderation makes it more effective and saturation makes it unpalatable. Metaphorically, the dish is culture. The dish is social solidarity. The dish is commonality in terms of language, values, beliefs. Immigrants, like salt, improve the dish by enhancing its starting flavor — whether it’s a local delicacy, a regional specialty, or a national favorite — when applied in moderate amounts. Extending the metaphor: In the same way that salt is not automatically bad, unless you’ve got a condition which salt may exacerbate, immigrants are not automatically bad. Limiting salt does not mean never using it, it means using it sparingly, in the right amount to make the best dish. So, too, with immigration. Limiting immigration is meant to keep from ruining the societal dish. Or, to borrow a phrase, to keep from turning the “melting pot” into an unappetizing mess. If only the chefs in the governmental kitchen had discerning palates, and could agree on the menu. As I wrote in my newsletter yesterday,* I thought about writing a “2018 Year in Review” piece, and then I thought about writing a “What’s Coming Up in 2019” piece, but I decided that I didn’t like either idea. It’s not that 2018 was terrible — it was okay, it had some nice moments — and it’s not that I expect 2019 to be particularly troublesome. No, what I’m trying to do is shorten my perspective. Instead of looking at the past or the future through a metaphorical telescope, and trying to bring them closer to learn more about them, I want to look at now, at the present, to see it more clearly. I want to see each day through a lens of gratitude, thankful for being alive and for whatever opportunities I have. I want to see things as they are, not through rose- or any other-colored glasses. And I want to do what I can, when I can, to discharge the responsibilities I’ve taken on — and especially to be careful about taking on any new responsibilities, lest I fail and let myself (and maybe you) down. So here’s to the New Year! Let’s make it the best that we can. *Join my mailing list here, if you will. It seems pretty evident to me that sometimes you choose your enemy, but sometimes the enemy chooses you. And sometimes things act as enemies that we may not usually think of in those terms. Those enemies are nebulous, incorporeal. Not nations, nor people, but ideas, concepts, for which the terminology of battle may be ill-suited. When it comes to things like that, I think of permanent as opposed to temporary enemies. Permanent or abiding enemies may not hold our attention as much as temporary foes that spring up and must be dealt with ad-hoc. A short-term enemy attacks; a long-term enemy infiltrates. Perennial enemies operate at lower levels and over longer timelines, it seems, than do enemies that charge us with sudden ferocity. Charles Dickens identified two such eternal enemies in A Christmas Carol. In one memorable scene Scrooge is surprised to learn that the Ghost of Christmas Present stands upon two dirty, emaciated children he names as Ignorance and Want. The human race may face other timeless and shadowy enemies, but these two must be included on the list. Are they brother and sister, as intimated by Dickens, or are they partners of some sort? Do they feed one another, help one another, keep one another alive? Is one dominant? Is one the forcing function of the other? Are they related to what may be considered another perennial and sinister enemy of mankind: injustice? Is our political or ideological outlook based (at least in part) on which of these, Ignorance or Want, we consider cause and which effect? This may be something of a chicken-and-egg argument, but we often differ over which problem is worse and deserves the most (and the most immediate) attention. Unfortunately, these permanent, intangible enemies do not arouse as high a degree of fervor as more acute and palpable enemies. 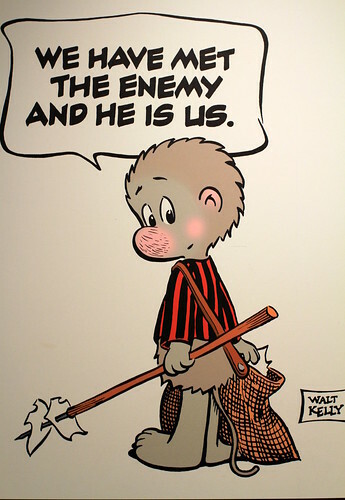 Even if they did, in the long run we have to include Ignorance in the same category as Want in terms of Christ’s observation, to wit: that just as we will always have some poor with us, so too we will always have some dimwitted. We cannot eliminate either, but we would do well as a society if we could minimize both. So let’s talk about salty language. 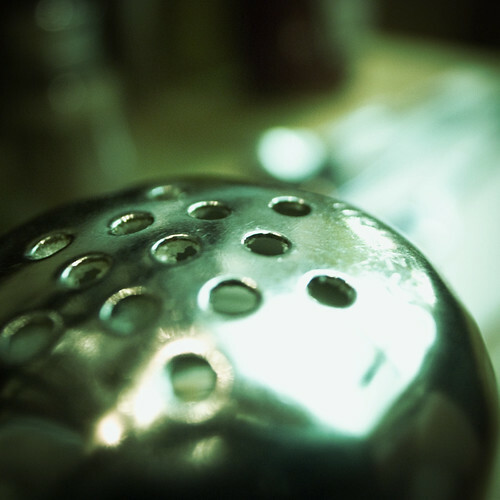 On the one hand, we may mean the kind of gracious speech that Saint Paul directed the Christians at Colossi to use: “seasoned with salt,” rather than overloaded with it, when giving an answer to anyone who might inquire about Christ and why they followed Him. We who follow Christ today would do well to bear that in mind as we do our best to speak the truth in love, not in anger or bitterness. On the other hand, and in my experience more frequently, salty language means something quite different. Foul language. Crude language, whether profane or vulgar. Here, too, the point remains the same: A little goes a very long way. I know quite a few people who make such a habit of vulgarity or profanity that I cringe whenever I sense they’re getting ready to speak. I confess that in the service I developed some bad habits along those lines myself, that I have not overcome: Very frequently, my first inward expression of frustration or anger is an obscenity, even if I successfully chisel off the hard edges of my language most of the time when other people are around. As our culture has coarsened, though, I’ve observed more and more people who interpret “freedom of speech” to mean “freedom to express anything in any way,” and they frequently employ vulgar or profane language on social media posts or in other ways: on bumper stickers or T-shirts or even tattooed into their flesh. Maybe they’re right to do so, and would be justified in scoffing at me for even suggesting that they could exercise a bit more self-control. Maybe they’re expressing the kind of deep rage and dissatisfaction that can only be captured by obscenities, rather than just being lazy or trying to be edgy. 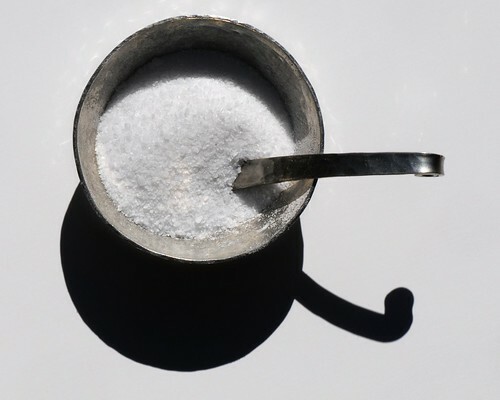 But as with salt itself, so with salty language: moderation makes it more effective — its relative rarity calls attention to it and it bears more emotional weight — while saturation just makes it unpalatable. Salt is a wondrous combination of two things — sodium and chlorine — that are dangerous and poisonous on their own. It’s important enough to life and history that Mark Kurlansky wrote an entire book about it (highly recommended). But salt’s goodness has limits. Those of us who are Christians should bear that in mind. Christ’s words to the disciples hold true for us, yes: We are — not should be, not could be, but are — the salt of the Earth. 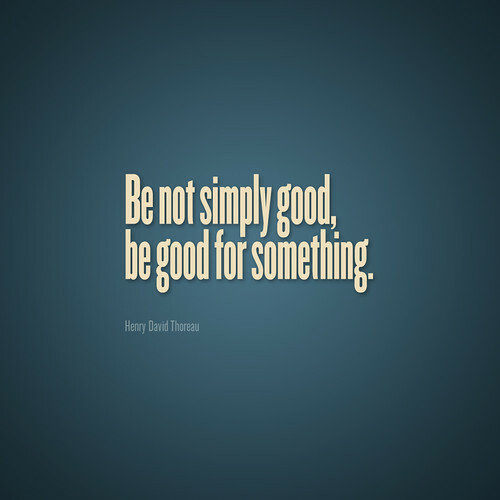 And we should take care to retain our saltiness, lest we be good for nothing. But our job is not to preserve things as they are, to keep them from rotting; it’s to improve things, to make them better than they were before and even better than they are on their own. We should take care to flavor the world, not to ruin it by dumping bucketfuls of our otherwise beneficial salt on everything in sight. Comments Off on Putting Service into Worship? I wonder what it would be like if a worship service were structured to emphasize actual community service? That is, what if a Sunday service began with praise and prayer and worship, but instead of following that with a sermon it segued into a period of no-kidding, hands-on service directed toward some specific need(s) outside the congregation? Sometimes we learn best by doing, after all, and the activity could illustrate specific Scriptures or just general principles. Maybe it’s been tried somewhere, but I don’t recall ever seeing it in any order of worship. Given how many evangelical churches seem to concentrate on offering entertainment value these days, I wonder: if a church were to institute such a thing, how well would we as congregants participate in it? Would we do it very often, or for very long? A while ago I wrote about pride, and particularly that pride gets a bad rap, but I wonder if sometimes other things masquerade as pride. That is, if other emotions may give us the same sensations as pride, and make us feel as if we’ve accomplished something even if we haven’t. That brings up the question of whether we can identify the physical results, the visceral sensations, of pride. Think back to something you did that went very well, and how you felt at the time. Not something routine, but something fairly important: instead of warming up hot dogs and being happy that they only got a little charred, you fixed a sumptuous meal to celebrate a special occasion and every dish came out perfect; instead of stammering your way through a presentation or some other public appearance, your delivery and timing were flawless and the audience hung on your every word; or whatever you can recall that was a clear victory for you, a triumph in your life. Think about that sense of accomplishment, in terms of what your senses told you. What did it feel like, deep inside? Was it the “thrill of victory”? Did you feel it through your chest, or down in your belly, or all over? Was it a little like being nervous, but at the same time being excited? Can you describe it at all? I don’t mean to imply that the same emotional states create the same physical sensations in each of us — in the case of these feelings of elation, it’s very possible that one person’s fluttering stomach is another person’s head rush is another person’s feeling of walking on air. But I wonder if that feeling we have during a moment of prideful accomplishment may be duplicated by other things. For instance: could it be that for some people defiance feels like pride? That is, is it possible that being defiant — whether acting rebellious or standing against a perceived authority — elicits the same emotional feedback as being proud of some accomplishment? I think back to times when I have been defiant, and the sensations may have been similar. Could other emotions also produce similar (or even indistinguishable) physical states to the feeling of pride? Thus, is it possible to feel something like pride without a clear, recognizable accomplishment of which to be proud? In part one, which you can read here if you like (and I’d be grateful if you did), I discussed what I see as a sad and unfortunate occurrence in the modern evangelical Protestant church: the emphasis on the church building, even when put in terms of how it serves the church body, more than on the church working in the wider world to help those in need. I haven’t collected statistics, so I can’t call it a trend, but I’ve noticed it over just the last couple of years in a handful of churches in central North Carolina so I think it’s safe to deduce that it may be happening elsewhere as well. Of course, you don’t need my approval to step out in faith (or to take out that mortgage) and build whatever kind of building you want. And you can believe “where God guides, he provides” and believe that God is guiding you in that endeavor. After all, Isaiah 58:11 says, “the Lord will continually guide you, and satisfy your soul in scorched places,” does it not? Now, let’s take a closer look at that “where God guides, he provides” idea. Scripture offers us many examples of God providing for his people, from the ram in the thicket that Abraham could sacrifice in place of Isaac (for which Abraham named the place “The Lord will provide,” or in Hebrew, “YHWH-jireh”) to the triple provisions of water, manna, and meat as the newly-freed Jews traversed the desert. And we can find numerous references to God’s guidance, in the form of miraculous clouds and fire, angelic visitations, dreams, and so forth; in accounts of people heeding that guidance or struggling against it; in exhortations to guide others wisely and warnings against false guides; in expressions of hope, such as “You are my rock and my fortress; For Your name’s sake You will lead me and guide me” (Psalm 31:3); etc. However, I haven’t found that pithy saying “where God guides, he provides” in Scripture. The closest match I’ve been able to find is that verse from Isaiah 58 quoted above, which mentions continuous guidance and follows that with the assurance that God will satisfy the soul (sometimes rendered “desire”). Looser translations go so far as to express that soul-satisfaction or that fulfilment of desire in the form of being given good food to eat, even when we are in deserted places. But I learned long ago that we can lead ourselves into error when we look at individual Scripture verses out of context. Is this not the fast which I choose: to loosen the bonds of wickedness, to undo the bands of the yoke, to let the oppressed go free and break every yoke? Is it not to divide your bread for the hungry and bring the homeless poor into the house; when you see the naked, to cover him; and not to hide yourself from your own flesh? Then your light will break out like the dawn, and your recovery will speedily spring forth; and your righteousness will go before you. The glory of the Lord will be your rear guard. If you remove the yoke from your midst, the sending out and speaking wickedness, and if you furnish yourself to the hungry and satisfy the soul of the afflicted, then your light will rise in darkness and your gloom will become like midday. And the Lord will continually guide you, and satisfy your soul in scorched places, and give strength to your bones. And you will be like a watered garden, like a spring of water whose waters do not deceive. Those from among you will rebuild the ancient ruins; you will raise up the age-old foundations; and you will be called the repairer of the breach, the restorer of the paths in which to dwell. I suggest two takeaways here. First, if the Lord continually guides us and satisfies our needs in hot, deserted places, then it must be that the Lord guided us into those hot, deserted places from the outset. Not into some cool, air-conditioned auditoriums where we can satisfy ourselves, where we can bask in the incandescent, fluorescent, and halogen glow of God’s love and enjoy the music of those angelic electric guitars, but into difficult places, dangerous places, where we might fear to tread were it not the Lord guiding us. Second, the guidance and provision come after we have done what the Lord would have us do: after we have loosed the bonds of wickedness and oppression, shared our bread with the hungry and the poor, and so forth. Then our light will shine like the dawn — or as Jesus said, so that others may glorify our Father in heaven: not so that we may be glorified as individuals or as a church. Then the Lord will answer our calls and our cries and our prayers. The Lord will provide for us while we do those things because those are the things He would guide us to do. Which means to me that if we are not doing those things — if we are taking care of ourselves by building fancy facilities at the expense of doing the good works which are the purpose for which we are saved (Ephesians 2:10), and without which we are dead in our faith (James 2:26) — then our light will be dim and gloomy to the world that is watching us. We may convince ourselves that our churches are alive inside, but from the outside their fancy trappings look like whitewashed tombs. I’ve been told, for more years than I can recall, that the church isn’t the building, it’s the people. I wonder if those pastors and congregations who put a lot of emphasis on (and pour most of their money into) big, impressive buildings still believe that. I think deep down they must, but I fear they’ve been seduced by spiritual scoreboards that tally baptisms and weekly attendance as if those are the measures by which Christ values their ministries. I’ve been told also that the road to Hell is paved with good intentions. And I’m beginning to think it may be lined on both sides with massive, expensive church buildings that sit empty and unused 90% of the time — and may be empty of compassion and pure religion even when occupied. Some months ago, at a church we were visiting, as part of his sermon the pastor presented a detailed design for a new multi-building campus. It was a “this is what we feel led to do” message, even though they had no land to build upon, and a prelude to asking the congregation to sign on to the ambitious vision. More recently, another pastor posted plans on social media for his church’s grand new building, reminding his congregation that it was about time for them to get their pledges in so the renovations and construction could commence. From what I saw, it looked quite spiffy (as so many modern churches do): lots of seats in the fancy auditorium, plenty of classrooms and bathrooms, and of course a first-rate visitor’s center. We’ve seen other churches propose equally bold schemes for expansion, all prefaced by the need to “step out in faith” — because “where God guides, he provides,” right? They’d say it’s all for the glory of God, no doubt, and maybe they even believe it, but it sure looks as if it’s for the glory of that church, that congregation, that pastorate. The emphasis is on the building, the campus, the edifice — that’s where the bulk of their treasure is going, and we remember what Jesus said about where our treasure is, right? Way to keep the tithes in the storehouse, y’all. After all, how much treasure does it take to build a building, pave a parking lot, renovate a fellowship hall? How much treasure is going to be locked away in cinder blocks and carpeting, heat pumps and flatscreen monitors, nurseries and offices and state-of-the-art sound systems? In comparison, how much treasure do they spend to feed the hungry, clothe the naked, or visit the lonely? That is, if we graphed it by amount spent (or by percentage), which column would be higher: facilities, or charity? And how great would be the difference? 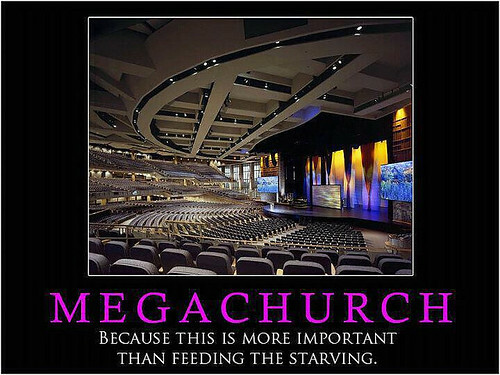 Of course their church needs a building, some base of operations, some place where the congregation can congregate. But if a widow or orphan in distress showed up at the door of their building, could they do much more than treat them to a great concert, a stunning light show, and a thoughtful message about how much God loves them? They’ve spent their treasure on that welcome center with the coffee bar, so maybe they can give them a cup of coffee, and they’ve got a wonderful house band so maybe they can give them a CD or DVD. And of course they can pray for them. But would they have to cash in a spotlight or a microphone or a monitor to actually provide those needy people with something that would make a difference in their situation? Maybe they’d say they’re most concerned with leading the lost to salvation, and that preaching takes precedence over reaching out a helping hand. But do they care so much about people’s souls that they don’t really care about them as people, or about addressing their physical, human needs? “And all Heaven just weeps,” sang Keith Green. These are the words of our Lord. Of course, they don’t need my approval to step out in faith (or to take out that mortgage) and build whatever kind of building they want. And they can believe that “where God guides, he provides,” and by extension they can believe that God is guiding them in that endeavor. After all, Isaiah 58:11 says, “the Lord will continually guide you, and satisfy your soul in scorched places,” does it not? Yes, but there’s more to the Lord’s guiding and providing. We’ll look at that in part two.